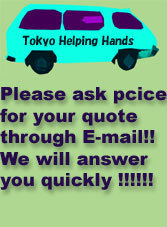 Tokyo Moving Company: Tokyo Helping Hands supports your moving, sayonara sale delivery, disposal, and storage! As we need written information, please send us three information. including One, Which station to Which station. Second, Which floor and elevator's availability for both apartments. and last one, The size and volume of the items to be moved. Please send to : tokyohelpinghands@gmail.com Thank you! Celebrating 10 years of helping people move with a smile. We always follow our 5 Priorities when providing our services to our customers! We always offer you a reasonable price. Friendly We are always friendly and open minded. Honestly The foundation of how we run our business. Our price - Just click the Price System for more details!! Our services are available start from 7,800~ yen!!! We will sort everything out!! This is very easy for us !! finished and you can relax your now . We will do the rest for you!!! Trust us!!! There seems so many boxes!!? No worries!!! 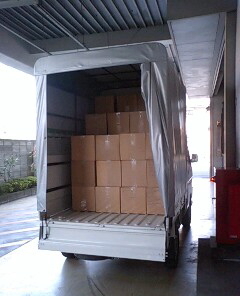 We will put them into the truck one by one!! We still have so much space left!! Let's finish all of them!! Please e-mail us anytime for all of your moving needs!! 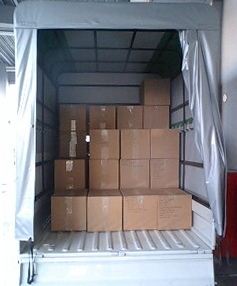 If possible, please include a photo of the items to be moved. This will help us to provide you with a more accurate price. Please note, however, that telephone quotations are not possible. Please be sure to leave a message (Preferred date,name and moving out location) if you get our answering machine. If more than one trip is required, up to 25-50% discount is offered for the following trip(s). Most washing machines installed free.